The adjustable wire will already be secured at one side of the hair extensions. When first receiving your Quick Fit extensions, place the extensions at the back of your head, approximately half way up your head. The wire will then go across the crown of your head. Place the wire through the elastic loop on the other side and secure with a knot. 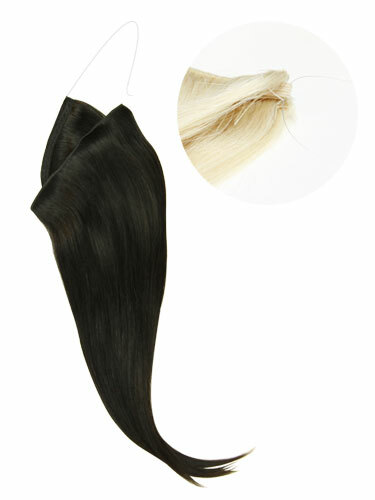 Your I&K Quick Fit hair extensions will now be ready to wear. Place the wire across the crown of the head, and move the hair extensions down to the back of the head, approximately half way. Once the Quick Fit extensions are secure with the wire sitting firmly on your crown, pull the top section of your own hair over the top of the Quick Fit extensions and brush gently to blend in with your own hair and conceal the wire. Went in to Hairtrade Braehead Glasgow , asked about the Halo, the girl serving although polite was not very helpful. I asked to try one on , could try a sample but not the colour I was trying to match , I'm very surprised no hair samples , at £70 it's not something you want to be purchasing to realise it's a mistake! I did try to colour match with a hair extension I had previously taken out . Got home to discover the colour not that great a match when opened and the wire needs adjusting and this wasn't explained in shop, having giving it a try , I returned to the shop to ask the same assistant if she would be kind enough to help me try adjust it, again not the most helpful and saying she is not a hairdresser, I sat down , she fiddled about with it for me to get home to it not being secured at all. Cannot deny the hair feels really good but very disappointed that in a shop solely for hair products that staff are not experienced enough. Was going to recommend this to my sister in law , might just hold off on that . I love it because it is so fast and easy to put and take away. I have been using it much more often than my clip-in extensions just because it's so fast and easy. It doesn't damage your hair at all and the wire doesn't feel bad in your scalp as I was wondering before testing it. I wish there would be more hair in this extension and it would be a bit longer. It says 18 inch as lenght but it gives me pretty much the same lenght as my 14 inch clip-in extensions. I also wish there would be more hair. To make it a bit thicker I attached one piece of my 14 inch clip-ins on it. It's also quite expensive when thinking the lenght and the thickness of the hair. Hairtrade is also missing an instruction video of how to set this extension, though you can find many from YouTube by searching "Halo extensions" or "Flip-in extensions".